With the help of speciality equipment and technology, Harris Glass can produce precise and repeatable etchings on glass windows, door panels, balustrades, mirrors and more. 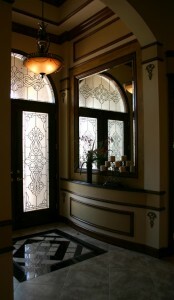 Etching uses chemicals to create an authentic frosted look on glass. It is also more economical than sandblasting, which uses grit, walnut husks and other materials to blast glass and create frosted designs. Using modern precision tools, the glass is etched with the abrasive substance to leave a rougher surface and translucent appearance. This process is usually done after the glass has been blown or cast. Although it is often known as acid-etching, it is more common nowadays to use ferric chloride a corrosive salt to handle the etching. Using this type of salt is safer as it doesn’t cause burning to the skin and doesn’t stain or produce harmful gases. It even improves the quality of the etched finish in comparison to acid. You can rely on our team to offer the highest standard of glass etching services for all kinds of applications particularly in the commercial sector. These include pub door panels, office partition screens, light shades and balustrade panels. Our combination of long-standing industry knowledge, accreditations and rapid service mean we can offer competitive prices and excellent value to local customers in Wolverhampton. To find out more and to receive an honest quote, get in touch today. We will be happy to help you.